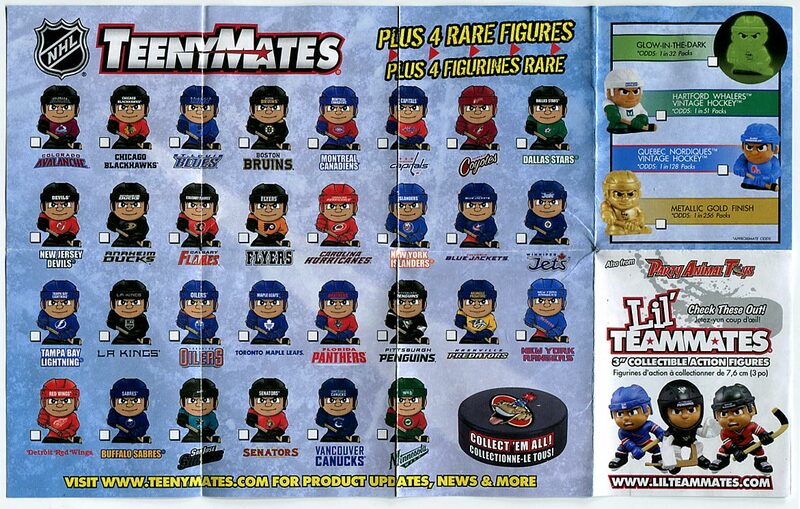 TeenyMates — perhaps the smallest hockey toys ever — made their NHL debut for the 2013-14 season. They are made by a company called Party Animal Toys, who also has a line of 3-inch tall sports figures called Lil’ Teammates. So just how small are TeenyMates? They measure about an inch tall, just a smidge taller than a U.S. quarter. 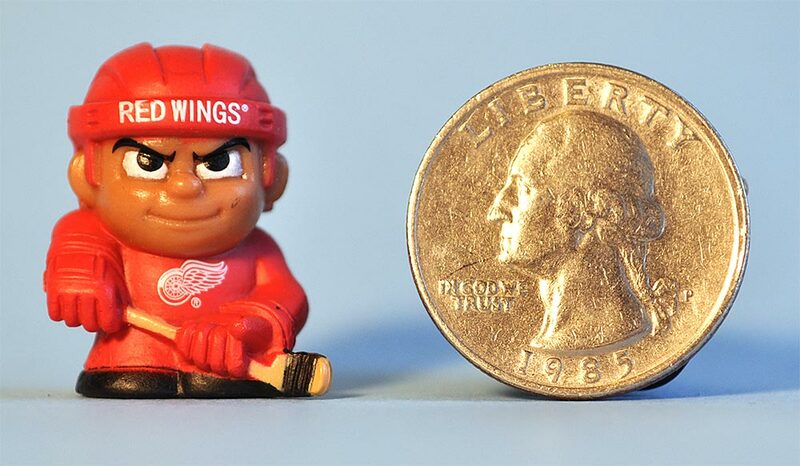 The figures are fully licensed by the NHL, and seems to draw inspiration from both Japanese anime — with their big, cartoony eyes — and the “Lil’ Sports Brats” keychains from the 1990s. Each figure has the team name across their helmet and the logo on their jersey. 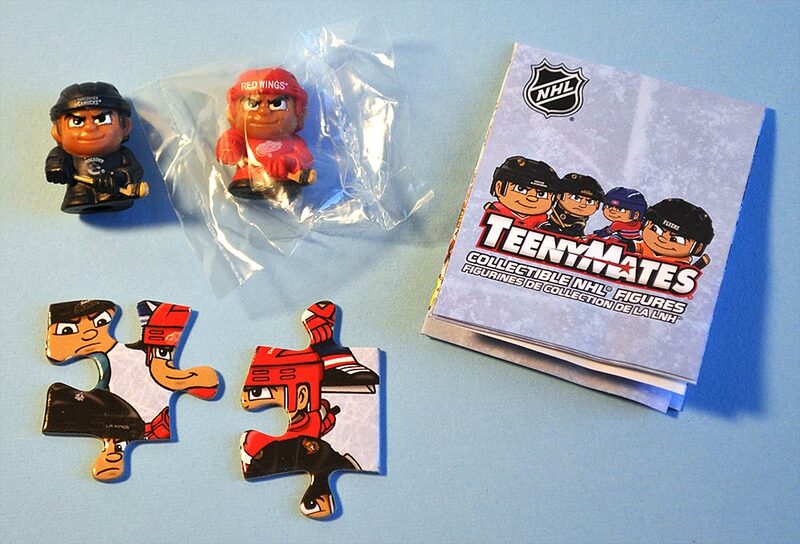 A pack of TeenyMates costs $3.99 and contains two random figures, two random puzzle pieces and a pamphlet. One of the figures is wrapped, presumably so that it does not rub against the other figure, which could remove some of the paint. 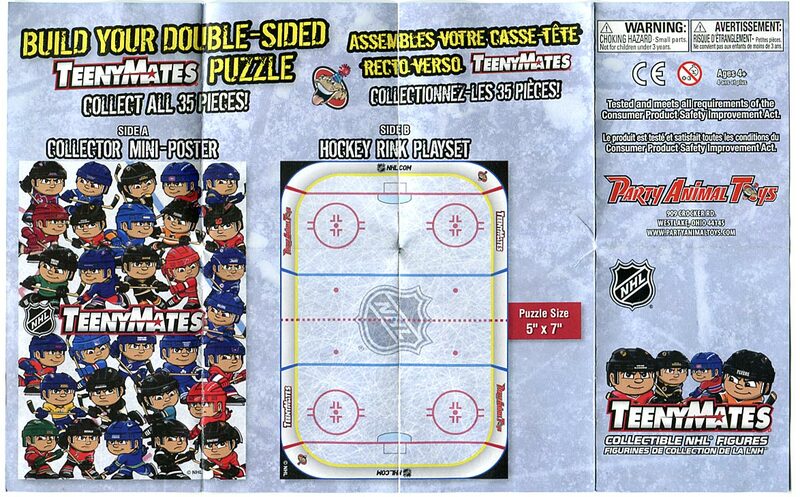 The puzzle pieces are two sided, with one side making up a rink and the other side making a poster of all 30 TeenyMates. One side of the pamphlet shows what the completed puzzle looks like. The other side of the pamphlet shows all 30 figures plus a few — HEY, WHAT’S THAT IN THE CORNER? 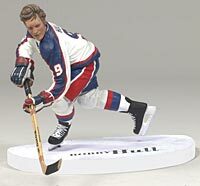 OH MY GOD — THEY MADE A NORDIQUES FIGURE! And a Whalers figure too. Of course, those are the “chase” figures that are harder to get, as are the Metallic Gold and Glow-In-the-Dark figures. Recently, I opened four packs of TeenyMates and photographed the figures. Not pictured below but also included were two puzzle pieces per pack. Here are the figures I got. Pack #1: Los Angeles Kings figure & Carolina Hurricanes figure. The figures use the official “team font” on their helmets. 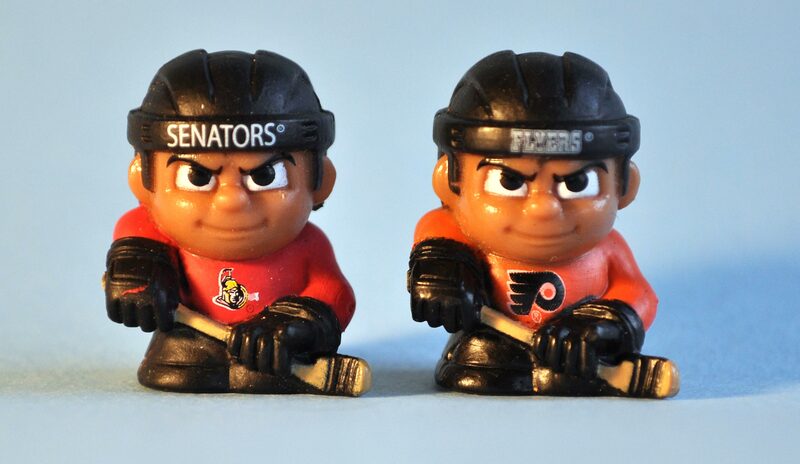 Pack #2: Philadelphia Flyers figure & Ottawa Senators figure. You’ll notice that all of the figures are left-handed shots. 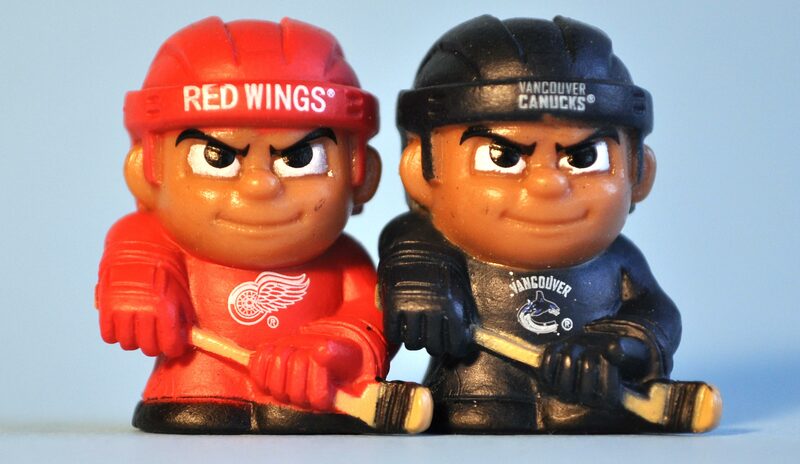 Pack #3: Detroit Red Wings figure & Vancouver Canucks figure. 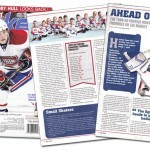 All figures have the text “© NHL” on their backs. 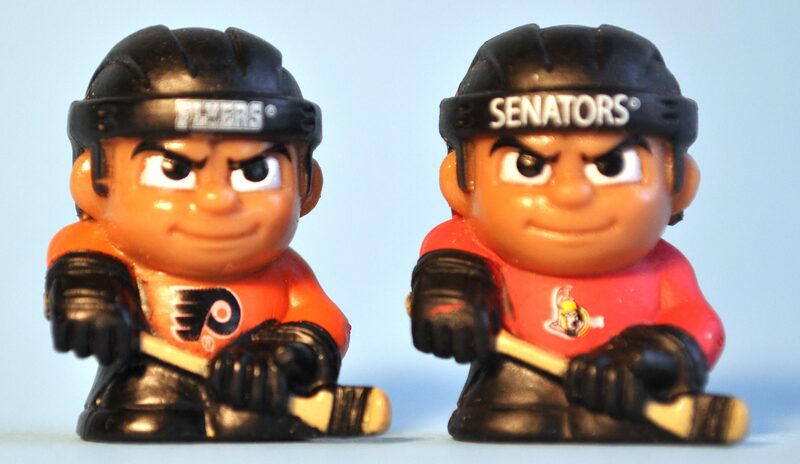 Pack #4: Ottawa Senators figure & Philadelphia Flyers figure. Basically, this was exactly the same as Pack #2. Even the two puzzle pieces were the same. 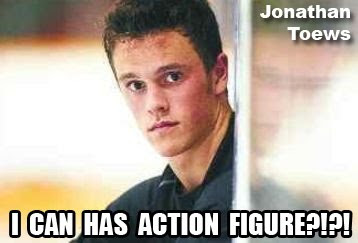 In a set of 30 figures (not counting the four chase figures), doubles are to be expected. But getting the exact same two figures is a bit worrisome. Perhaps the figures aren’t packaged very randomly. 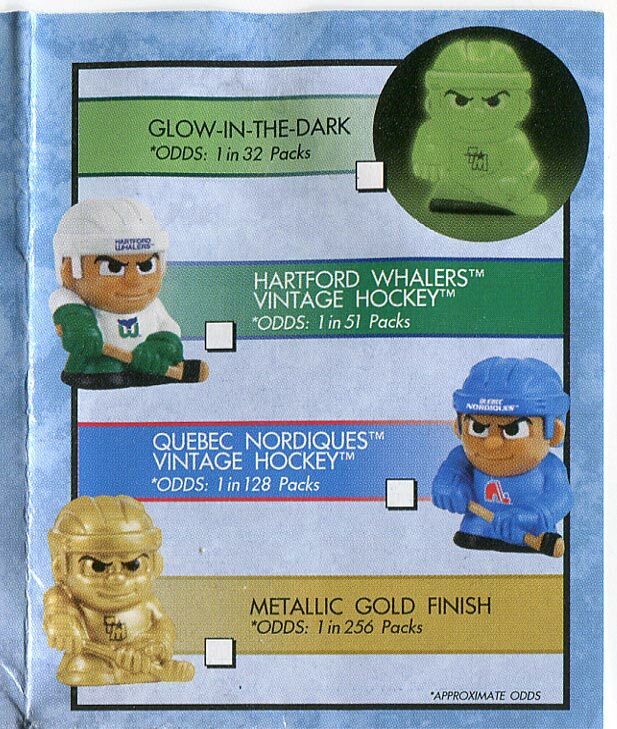 That is, maybe every pack that contains a Flyers figure contains a Senators figure, every pack that contains a Red Wings figure contains a Canucks figure, and so forth. What I like about TeenyMates figures: Incredible detail for one-inch tall figures.The smug looks on their faces makes me smile. 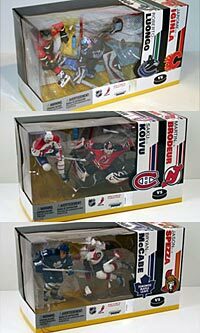 The idea of getting a Nordiques or Whalers figure is pretty cool, though the odds on those are a bit long. The rink puzzle is a good idea, since it will give kids a “scene” to play with their TeenyMates figures. What I dislike about TeenyMates figures: All the figures are exactly the same –how about a right-handed shot or a goalie for some variety? The collation seems questionable, at least based on the sample packages. If you are a kid — or have kids of your own — then you might rate this product higher than the 3 1/2 pucks I gave it. Two figures for $4 isn’t so bad when you compare that cost to other blind-packaged mini figures, such as G.I. Joe Micro Force. However, I wish there was a little more variety in the poses used for TeenyMates. 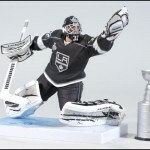 Party Animal Toys did release goalies in their line of Lil’ Teammates 3-inch figures; perhaps we might see a goalie or a righty skater in next year’s set of Teenymates, too. Special thanks to Party Animal Toys for providing the packs for this break. You can check out the TeenyMates website here. After the Beckett article, I knew it was only a matter of time before these popped up on here. While interesting, I’m not traveling down that road. It makes me remember when I went crazy over the Corinthian Headliners (not a good memory). I had dozens of those guys, all sports, still have many of them too. These are just gimmicky enough to remind me of the Roxx things that came out last year (or the year before?). They released “POG”-like designed ones in the US but NHL ones in Canada. Aw, c’mon. I think your boys would LOVE these figures. I also went crazy over the Headliners. Still have them, too. Be aware of collation issues with regards to these, my son bought several packs of the football Lil Teammates last year and the collation was terrible. After buying about 10 packs he had around 6 Arizona Cardinal figures and multiple ones of a few other teams. it was frustrating to see him spending his money on these figures and then being disappointed getting packs with the exact same figures that were in a previous pack. I ended up sending an email to the company complaining and they were nice enough to send some replacement packs. That being said if someone wanted to try and collect a complete set you’d probably be looking at spending hundreds of dollars. Thanks for sharing that story. Collation definitely does seem to be a problem with TeenyMates. I am not defending the company, but it seems with really small sets like this (only 30 different figures in the actual set), companies get what they call the “sequencing” wrong. The same thing happened in 2012 with Upper Deck’s National Hockey Card Day cards in the U.S., where, I would open three packs in a row and all 5 cards in each pack would be identical every time. The set was only 15 cards and I could not complete it after 15 packs. Of course, Panini stickers also seem to have consistently bad collation, but those sets number in the hundreds. It was nice of Party Animal Toys to send you some replacement packs, though. Hopefully your son got a figure that he wanted. They look pretty good, I love the anime style faces and the fact they have that much detail on them on a small inch is pretty neat. Can’t wait for the day I am cool enough to have companies send me free stuff for review, haha. 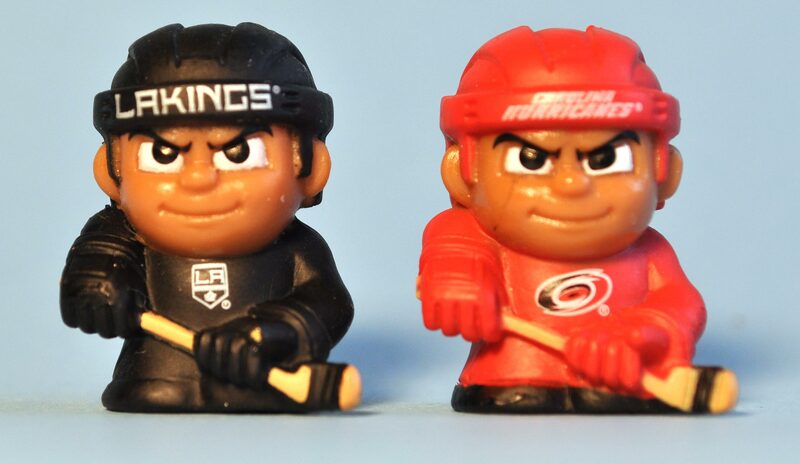 I only need two figures to finish the set I need Los Angeles Kings & Carolina Hurricanes. If anyone is looking to do a set let me know so I can trade for them. I got one of each that I will trade you. what figures will you want for trade, what do you need or looking for. Receive notifications of new posts by email. Enter your email address to subscribe.